Our network offers up some fresh, healthy competition. A student in Oceanside, California dips a freshly baked pita chip into a colorful watermelon pico de gallo. 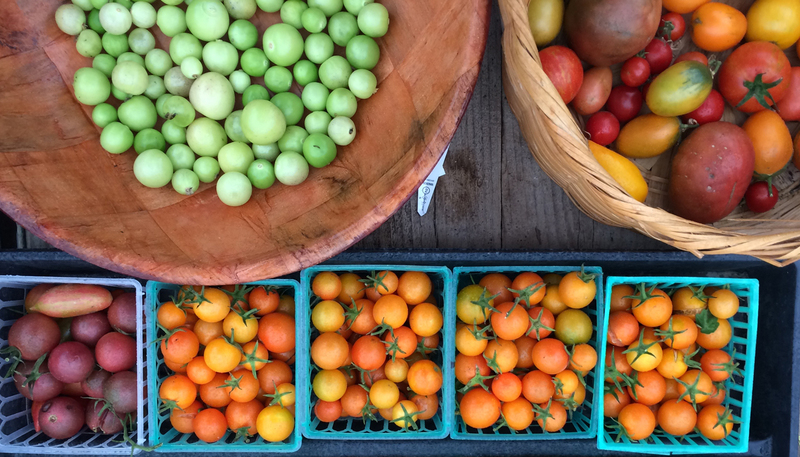 In Conejo Valley, Kitchen Manager Lori Nava reflects on a family tradition, preparing a fifty-year old salsa recipe for the salad bar. These moments were inspired by the Center for Ecoliteracy’s recent “California Thursdays Salsa Challenge.” The Salsa Challenge called on districts to showcase their creativity and culinary talents by preparing a unique salsa recipe, engaging students and staff, and promoting the statewide California Thursdays® effort through events and photos posted to social media. The Salsa Challenge was adopted from one of several classroom lessons recently produced by the Center for Ecoliteracy to bridge healthy eating and food literacy between the cafeteria, classroom, and school garden. Each lesson highlights California-grown crops through hands-on, experiential activities, and is available here for classroom use, or in after-school and summer feeding programs. “The Tomato Salsa Challenge” lesson encourages students to recognize the unique qualities and tastes of different tomato varieties, while working in teams to create a recipe using tomatoes. Responses to the California Thursdays Salsa Challenge were as vibrant and diverse as the state of California itself, as demonstrated by the “Best Overall Photo” winners and their stories below. These districts each received a $500 cash prize to support professional development or farm-to-school programming. 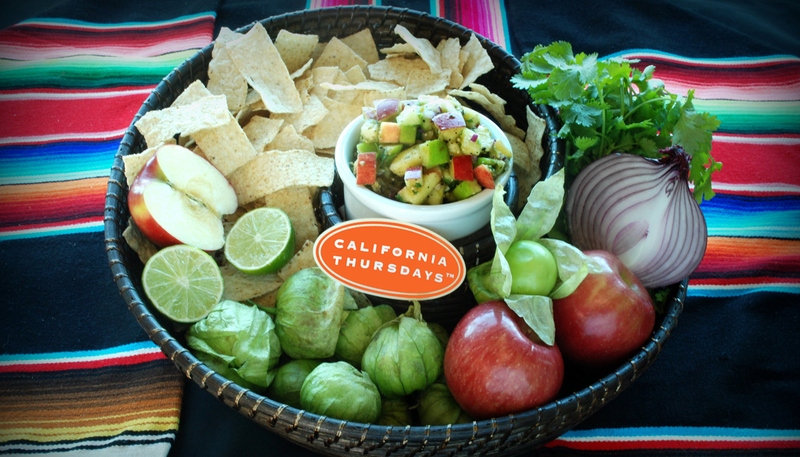 Manteca Unified School District created a tomatillo apple salsa with roasted tomatillos, chopped apples, cilantro, onions, and jalapenos. They roasted their tomatillos on the grill, though this can also be done by placing tomatillos on a sheet pan and baking at 350 degrees (remove husks and toss with olive oil before baking). San Francisco Unified School District served a strawberry pico de gallo atop homemade chicken nachos, with baked tortilla chips. The recipe was developed by Galileo High School Kitchen Manager Jorge Mancera, who enlisted the help of health class students to prepare and market the new recipe. Districts who received the most “likes” on social media received $250 towards California Thursdays promotional items. Those honors went to Hemet Unified School District (Twitter), Oceanside Unified School District (Instagram), and Conejo Valley Unified School District (Facebook). The Salsa Challenge demonstrated that there is no one right way to prepare a salsa; it can vary in ingredients, flavors, and preparation, and serves to accent the flavors of a dish. 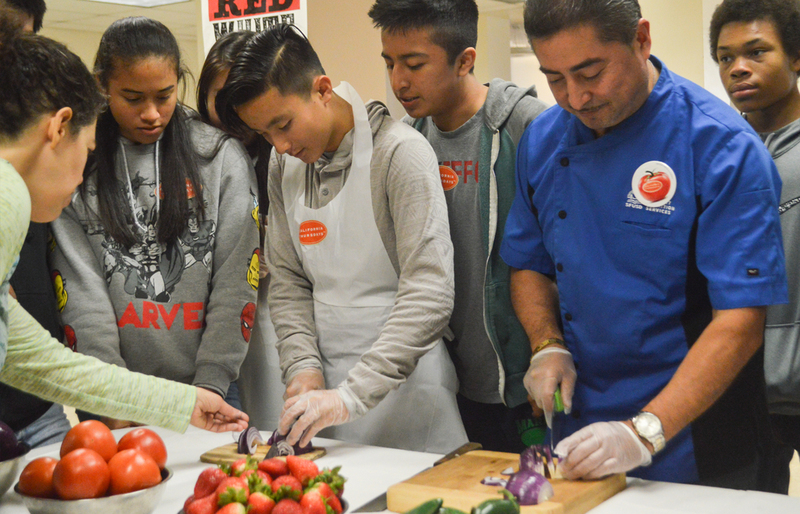 Similarly, the California Thursdays initiative is uniquely adopted in each district, accenting the inspired efforts in place to serve their diverse students high-quality, freshly prepared meals from California-grown foods.